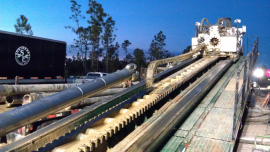 CGLLC has experience with conventional support-of-excavation techniques including but not limited to soldier pile and lagging, chemical and cement grouting to control ground water; strand, bar and helical pile tiebacks; sheet pile systems; and soil nailing and shotcrete. Constellation Group LLC provides on-site training for contractors wishing to self-perform these activities. The largest pile test include taking a 16 inch driven steel pile to failure (intentionally), at 230% of design load- over 930 kips! Working for a major general contractor in NJ, Constellation Group LLC was hired to conduct all testing and stressing of 400 plus tiebacks and multiple soil nails- all for support of excavation: and 28 permanent ground anchors. This project is part of an expansion of Philadelphia’s world renowned Children’s Hospital. Test capacities reached 500 kip. This is the deepest excavation in Philadelphia- 60 feet. All test reports were turned in digitally within 24 hours of leaving the jobsite. Other geotechnical experience includes micropiles, helical piles, chemical and cement grouting to control ground water and compaction and karst void filling grouting. Highest loads tested are over 800 kip.